We are pleased that for the first time during our project, we exhibited the EPAD study at the Alzheimer’s Association International Conference (AAIC) held on 22-26 July. With its neat white walls and signature green colours, the EPAD booth at the start of the exhibition area at this year’s record size AAIC in Chicago stood out not only for the constant stream of attendees stopping by at the booth but also for acting as a great meeting area for catching up with the many current and future EPAD collaborators. We are delighted that during the four day conference, around 400 people stopped by at the EPAD booth to hear about the study and exchange ideas. 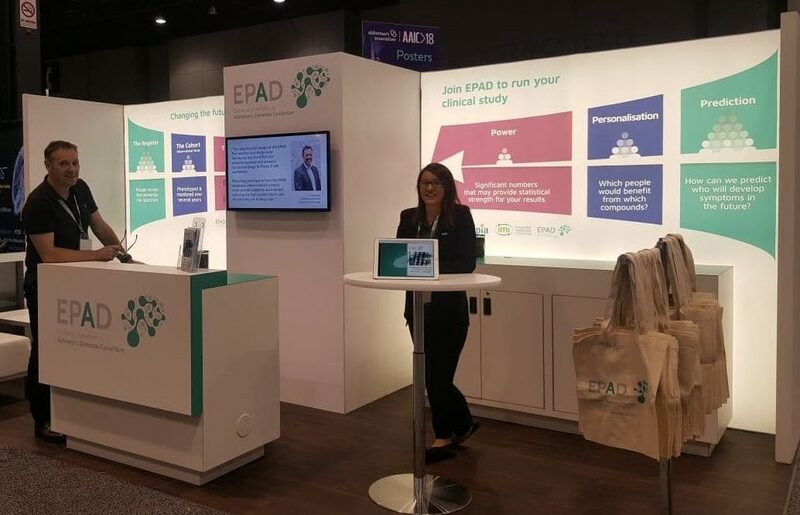 In addition to the interest received from the attendees stopping by at the booth, the EPAD leadership used the AAIC as a fantastic opportunity to manage a back-to-back diary with an intense four days of meetings with other world experts on Alzheimer’s disease prevention. At AAIC 2018, the aim of the EPAD booth was not only to introduce the EPAD study and learn from our academic and industry partners, but crucially, to showcase the EPAD PoC trial platform. We are very excited about the many conversations had at the booth and the enthusiasm and support shown for our bold innovative platform. Adaptive trial design, placebo sharing between study arms, cost-effectiveness of using a readiness cohort and a low screen failure rate were only some of the topics frequently brought up over discussions at the booth. On the second evening of the AAIC, we held a satellite symposium dedicated to the EPAD PoC trial to allow for presentations and a question and answer session from interested intervention owners. The AAIC is notoriously packed with tremendous sessions running late into the evening and as such, we are very grateful to all who chose to attend the EPAD PoC trial platform launch. At the event, the EPAD leadership presented the uniqueness of the platform and addressed a great set of questions from the audience. It was encouraging to see and hear a lot of interest for the EPAD PoC from our key industry contacts. We were thrilled to also see EPAD mentioned at numerous talks during the AAIC. Notably, Miia Kiviepelto highlighted the EPAD study as one of the world leading initiatives in Alzheimer’s dementia prevention during her wonderfully captivating plenary session. Finally, as the EPAD-booth debut at AAIC draws to a close, we want to thank all the Epadistas who made our AAIC 2018 big splash possible by working diligently, across time-zones, to create high quality content in the form of a brochure and a new updated EPAD website with a new informative section for research participants. This hard work and attention to detail was picked up by many who stopped by at the booth. The Alzheimer’s community is painfully aware that there have been no major breakthroughs in interventions over many years. We have learned from the past and believe our innovative trials platform is different. The EPAD mentality starts with small things like only purchasing merchandise in sustainable, recycled cotton and recycled plastics, finishing with ground breaking complex adaptive trials design. 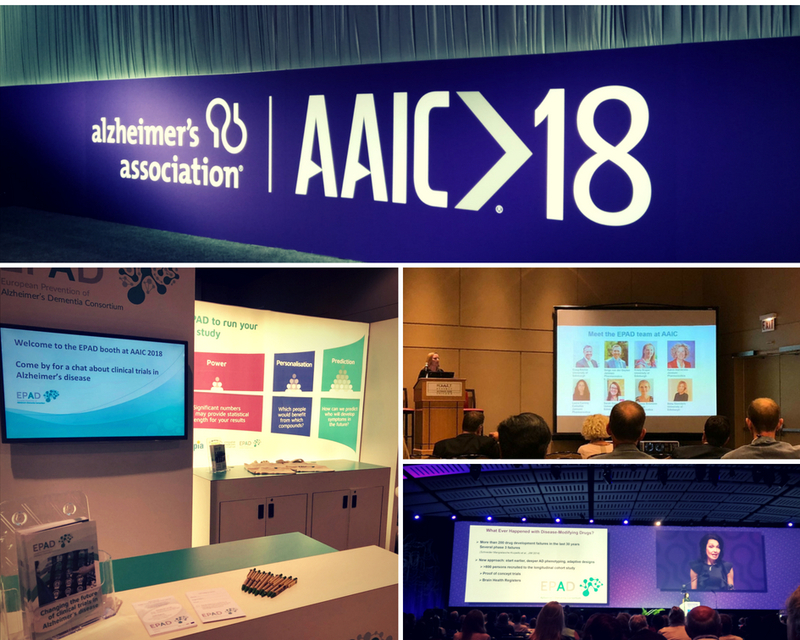 We are truly thankful to all the individuals at this years AAIC who really blew the wind in our sails by acknowledging our innovative approach to preventing Alzheimer’s dementia and standing by our ideas of changing the future of clinical trials in Alzheimer’s disease. We look forward to continuing the conversations at next years AAIC in Los Angeles.